Your child has asthma; naturally, you are concerned about your child’s well being. To help your child, you need to put your own feelings aside. Try not to panic when your child has an asthma attack. Your best weapon against asthma is education. Learn all you can about asthma, and how to help your child during an asthmatic episode. You can start learning about your child’s asthmatic condition by talking to your child’s pediatrician. Don’t be afraid to ask questions. The doctor will have patient education material in his/her office; all you need to do is ask for it. The Internet is a very good resource for learning about how to care for your child’s asthma. Parents should be aware that the physical activity of child’s play can initiate an asthma attack. Your child may not be able to adequately express how he/she is feeling, so it is important that you observe your child for potential difficulties. If you know that when your child plays hard and gets hot and sweaty that he/she tends to have difficulty breathing, you will have to monitor his/her playtime. You may need to ask your child to sit down for a few minutes to rest before he/she gets up to play again. You will have to observe and moderate your child’s physical activity, if he/she isn’t old enough to know when to slow down. It is important that the parent understands the child’s medication and treatment schedule. Your child’s doctor may have prescribed medication that is to be given every day. Your child may also require daily nebulizer treatments. A nebulizer is a device that delivers medication to the airways and lungs. You may need to assist your child with using the nebulizer, because it is important that this treatment is done correctly. It is vitally important that you administer all the medications as ordered. If you don’t understand any part of your child’s medication and treatment regimen, you should consult with the attending physician to understand how to care for your child. Very often a child has a bad asthma attack because the medications were not administered properly. Sometimes parents expect their older children to monitor their own medicines and treatments, but sometimes they could forget. It is important to take charge of your child’s health care practices, no matter how independent he/she might seem to be. Part of being an observant parent, is to recognize the symptoms of an asthmatic episode. The symptoms of asthma are wheezing, coughing, being short of breath, and paleness of the lips, nails, and skin. The lips and nails may take on a bluish color if you child is not getting enough oxygen. 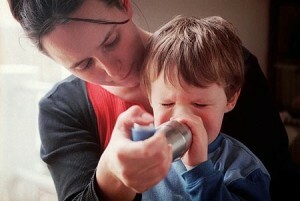 Besides the obvious, there are other signs that may indicate your child is about to become sick with an asthma attack. Your child may become lethargic, feel sick to his/her stomach, and lack an appetite. It is important that you observe how your child breathes while he/she is sleeping. You should know how your child breathes while in a relaxed state, so you can compare that breathing with his/her respirations when awake. You may not be able to keep your eyes on your child all hours of the day; however, if you see that your child is wheezing, coughing, or short of breath, you should be able to address the problem right away to avoid a full blown asthma attack. Your child may have a rescue inhaler that will stop or reduce the asthmatic symptoms. Your child may also have an inhaler that is administered 2 or 3 times throughout the day for maintenance. To be able to take care of your asthmatic child effectively, you will need to understand how asthma affects a child’s well being. You also need to stay in tune with your child’s state of well being, so that you can recognize the symptoms of an impending asthmatic episode before an attack happens.